Fondue is one of the tastiest, coziest, and most social meals you can put together, so it makes sense to celebrate this truly wonderful dish in the blustery month of November. Can’t make it out to the famed restaurant La Buvette des Bains in Geneva to try the truly authentic version of fondue? Not to worry. With the right cooking equipment, fondue is easy enough to make and share with your favorite people during National Fondue Lovers Month. Oh, and no double-dipping! Swiss restaurateur Konrad Egli invented chocolate fondue at his Chalet Suisse restaurant in New York as part of a promotion for Toblerone. Fondue was promoted to Americans inside the Swiss Pavilion's Alpine restaurant at the New York World's Fair. 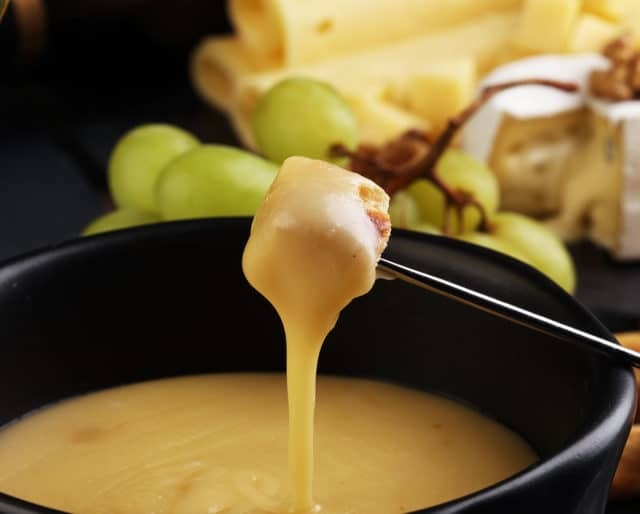 The Swiss Cheese Union declared that fondue is the Swiss national dish. The earliest known recipe for cheese fondue appeared in a cookbook published in Zurich under the name "Käss mit Wein zu kochen" — "to cook cheese with wine." It calls for grated or cut-up cheese to be melted with wine, and for bread to be dipped in it. Most standard fondue pots are made of ceramic and cast iron, and a fondue set will include forks and its own burner. It's essential that you share the deliciousness with your friends. Have people bring sides or drinks while you whip up different versions of the main course. From brothy fondue chinoise to oily fondue bourguignonne and wine-flavored fondue vigneronne, it's easy to break away from just having cheese or chocolate. As part of its promotion of fondue, the Swiss Cheese Union invented the phrase "Fondue isch guet und git e gueti Luune" — translated to "Fondue is good and creates a good mood", and abbreviated as "figugegl." A tradition says that if a person loses their piece of bread while dipping into the fondue pot, he or she buys drinks all around. Fondue etiquette requires no double-dipping and no eating directly from the dipping fork. Citizens of Geneva only drink hot tea or cold white wine with their fondue, because drinking anything else will probably cause indigestion. Traditionally, fondue in Switzerland is accompanied by a plate of pickles, pearl onions, and dried meats. Dipping sauce kept warm throughout a blustery fall or winter evening is the definition of comfort. Imagine this: a delicious sauce in a single pot, lots of morsels to dip, and many forks. It's the perfect recipe for a get-together with a bunch of friends for great food and conversation. In one night, you can move from a beer and cheese fondue to a Thai lemongrass fondue. Then, transition to a roasted garlic broth fondue with chicken or pork — and finish it off with a chocolate, caramel, butterscotch, or s'mores fondue. Expand your dipping imagination!